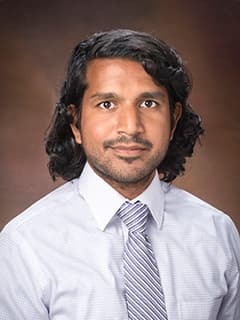 Kumaran Senthil, MD, is a pediatric critical care medicine fellow in the Department of Anesthesiology and Critical Care Medicine at Children's Hospital of Philadelphia. Senthil K, Serwint JR, Dawood FS. Patient End of Life Experiences for Pediatric Trainees: Spanning the Educational Continuum. Clin Pediatr (Phila). 2016 Aug;55(9):811-8. doi: 10.1177/0009922816631513. Epub 2016 Feb 18. Senthil K, Russel E, Lantos H. Preserving the Social Contract of Healthcare - A Call to Action. Am J Public Health. 2015 Dec;105(12):2404. doi: 10.2105/AJPH.2015.302898. Epub 2015 Oct 15. No abstract available.